Discounted Prices are tentative prices. Please call for Lowest price Deal. Virtually everyone who loves photography would appreciate one of the best cameras to come from the stables of Nikon – the Nikon D5500. 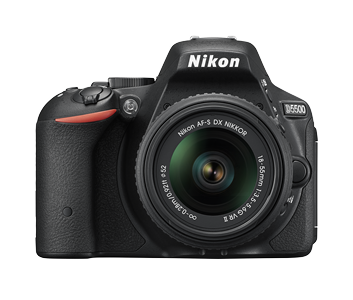 The Nikon d5500 specifications are upgrade from the D5300 version. The camera comes as a soothing relieve to persons that have been looking to get a DSLR. This is however not taking away the fact that it comes with its own drawbacks. One feature of the camera that has made it endearing to lovers of photography in India and the world over is its 24.2 megapixel camera sensor. This is in addition to the ease of handling the device and the solid noise reduction feature that is not found in many cameras. The style of the design of the body is quite different from the DSLR design style many of us are familiar with. It is quite smaller and a somewhat lighter than the previous D5300 version with a difference of about 60g, making using it and handling the camera much easier and comfortable. It comes with two manual control dial and a PASM mode dial allowing for easy accessibility and control for users. Besides the “I” being moved down from close to the shutter to the rear pad, every other thing remains really familiar. The Nikon d5500 price in India like in most other places around the globe is worth it but it is important to get the gadget from a trusted and reliable Nikon camera dealer Delhi to ensure you actually get what you pay for. One major addition to the Nikon D5500 when compared to the D5300 is the screen as it is a touchscreen compared to the latter which is non-touch. This also lets you to use the display as a manual control when you try to shoot with viewfinder. It also has the Wi-Fi feature that allows you to transfer your work from the camera to other devices wirelessly using the Nikon wireless Mobile utility app. All in all, the camera is a good one for experts and beginners and lovers of photography should not hesitate to contact their camera dealer Nikon for the D5500. Nikon d5500 price with freebies offer for limited period. Call now for special offer and discounts. Like an artist, a photographer’s vision shouldn’t be limited by his tools. Which is why we’ve created a DX-format DSLR that’s more intuitive than ever. The D5500 is thoughtfully designed with an intelligent eye sensor, vast improvements in image review, and a versatile touch screen vari-angle monitor to make it even easier for you to chase your creative pursuits. Its 24.2-megapixel image sensor without an optical low-pass filter (OLPF), is complemented with a powerful EXPEED 4 image-processing engine, all packed in a compact, lightweight body that offers a stronger, more secure grip. Built-in Wi-Fi® allows you to upload your impressive images seamlessly, so you can share your passion for photography with other like-minded enthusiasts. Approx.5fps, L: Up to 3 fps H: Up to 5 fps (JPEG and 12-bit NEF/RAW) or 4 fps (14-bit NEF/RAW) Note: Frame rates assume continuous-servo AF, manual or shutter-priority auto exposure, a shutter speed of 1/250 s or faster, Release selected for Custom Setting a1 (AF-C priority selection), and other settings at default values.